At the gates of Quimper, the Orangerie de Lanniron ***** welcomes you in a rare setting, combining with elegance the charm of tradition and the comfort of modernity. In front of the 17th century castle, beautiful landscaped gardens are terraced on the banks of the Odet where the sea rises to bring the sea air and make you taste the joys of sailing, canoeing or fishing. In the old farm of the carefully renovated estate, the restaurant offers a delicious cuisine with regional flavors. An outdoor swimming pool is also available with paddling pool. Opening from mid-May to mid-September. The Lanniron Orangery Golf Course is a 9-hole technical and fun course with practice, putting green, training bunker and proshop, lessons and courses. Possibility to take golf lessons with a professional, on reservation. - Breakfast options available on site, at an extra charge: traditional formula (bread, pastries, orange juice and coffee) or English formula (scrambled eggs, bacon ...). 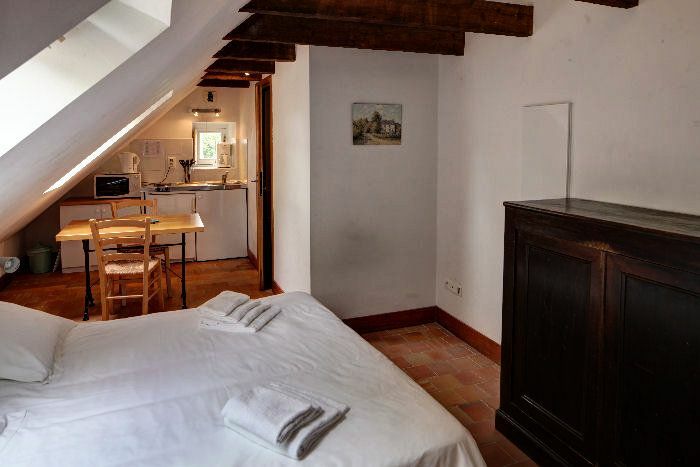 Studio on the slope of 28m² for 2 people, composed of a large living room, a kitchenette, a double bed, a bathroom with a shower and a toilet. The studio is equipped with an electric hob, fridge, microwave and all cooking utensils. Blankets, pillows, bed linen (beds made on arrival) and towels are provided. Pets allowed: 7 € / day - One animal per rental - Dog cat. 1 and 2 prohibited. No pets allowed in the studios.